This is a fine representation of an Indian soldier of the 37th Grenadiers. The Madras Army at the time comprised 52 Regiments of “Native Infantry”; only the 37th were designated as Grenadiers on account of their gallant conduct during the war in China in 1841 (the First Opium War). 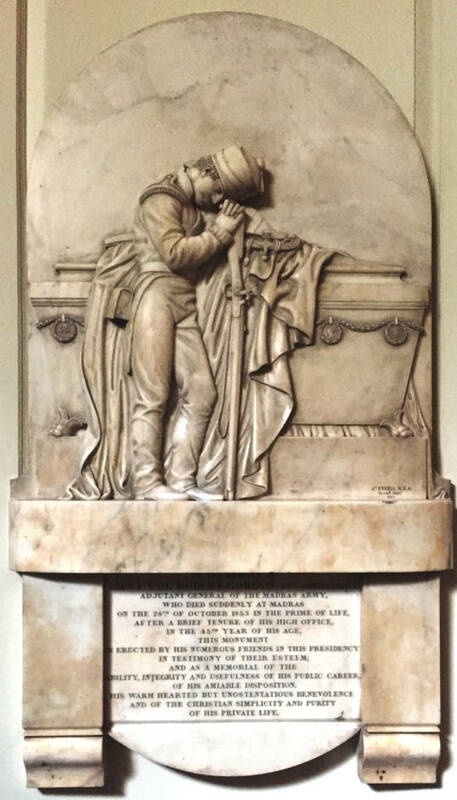 It is interesting that the sculptor, or more likely Gordon’s fellow officers and family, preferred a figure of an Indian soldier (sepoy) rather than of a British officer or of Gordon himself. This is quite common in British colonial monuments. As Barbara Groseclose comments; “Inclusion in a special fraternity, one based on the notion that all soldiers shared a life of rigor and duty, was awarded to the sepoy by including him on monuments”. The soldier is shown with “his arms reversed” (meaning his weapon is pointing towards the ground) mourning at the tomb of his officer. Little is known about Gordon himself. He joined the Madras Army as a Cadet in 1825. Latterly he served mainly in administrative roles; as Deputy Assistant Adjutant General in 1838, Assistant Adjutant in 1845 and finally Adjutant General of the Madras Army, in which role he died in 1853. He is not mentioned in Duncan McPherson's record of the regiment's service in China, indicating perhaps that he was on home leave at the time or that he remained in Madras. Dodwell and Miles. Officers of the Madras Army. London; Orme, Brown, 1838. Groseclose, Barbara. British Sculpture and the Company Raj: Church Monuments and Public Statuary in Madras, Calcutta, and Bombay to 1858. Delaware; University of Delaware Press, 1995. McPherson, Duncan. Two Years in China: Narrative of the Chinese Expedition from its formation in April 1840 till April 1842. London; Saunders and Otley, 1842.